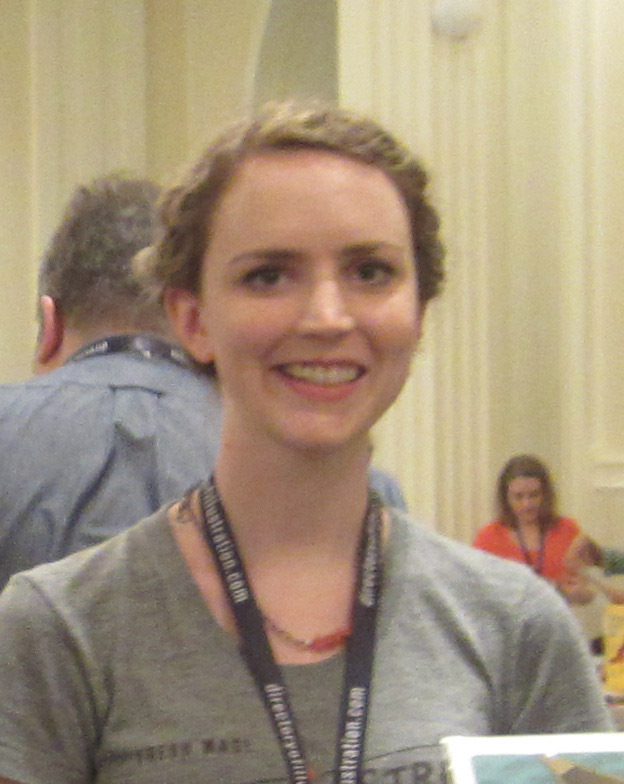 Last week I attended ICON: The Illustration Conference in Portland. The conference began with a bang with a performance from "the Circus Project." The most insane marching band I've ever seen stormed into the auditorium, followed by breakdancers, acrobats, people hanging from the ceiling on silk scarves and a girl who could shoot a crossbow with her feet. It was wonderfully bizarre. Portland ICON8 Opening ceremonies from Rick Lovell on Vimeo. ICON is a conference about "illustration" in general, and the theme of the show was "Work and Play." All day long we'd listen to an hour of lectures, then go downstairs for coffee and snacks, then upstairs for more lectures, repeat repeat repeat. I went into ICON with one old friend and some new friends. By the end of the conference we had bonded over our mutual experience of sleep deprivation and information overload. 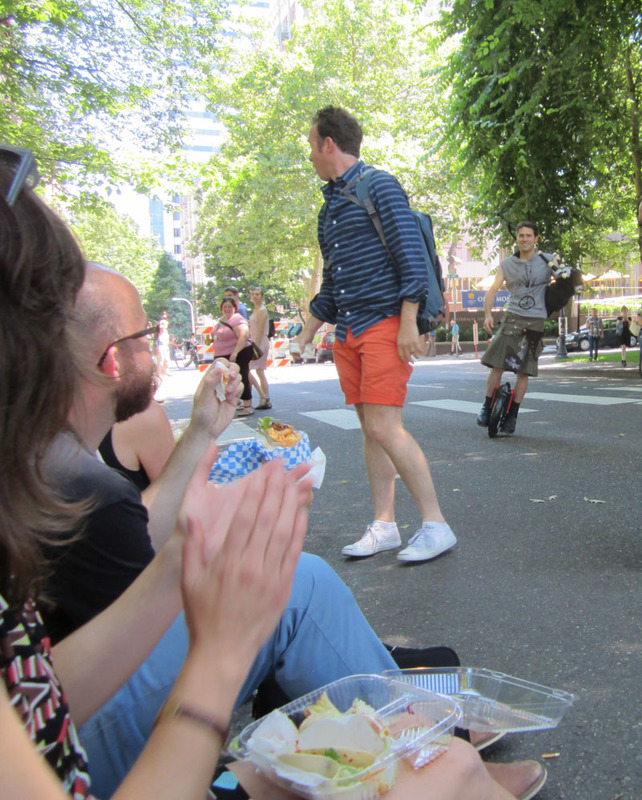 During lunch breaks we went to the famous Portland food carts and enjoyed the summer breezes. 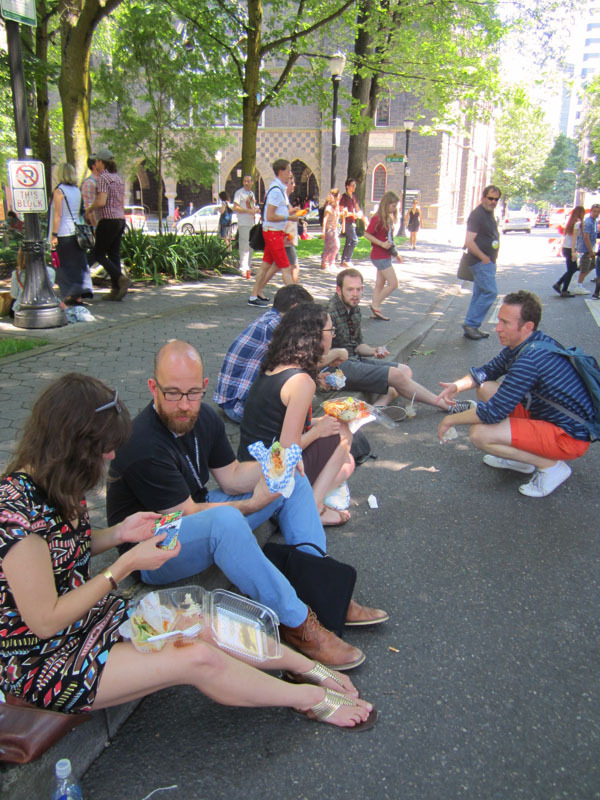 We ate lunch in the park and talked about how illustrators are the nicest people in the world. 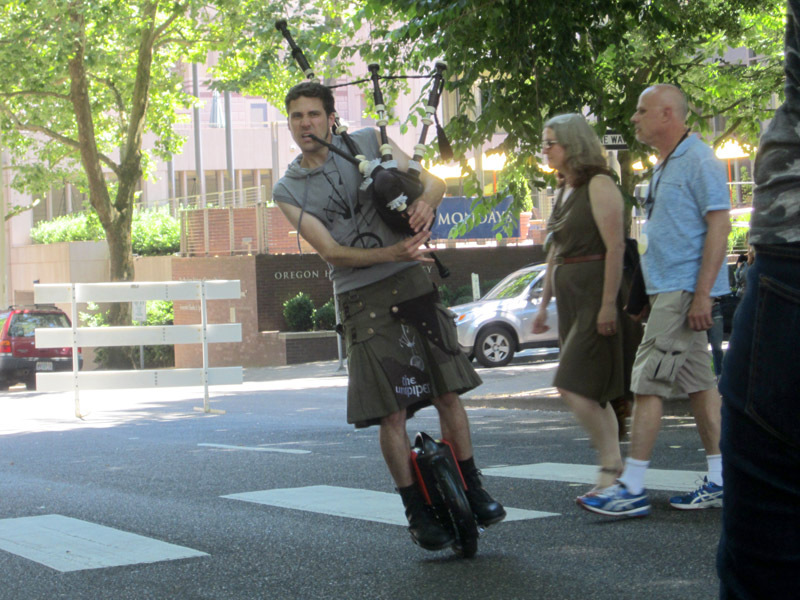 We saw the famous Portland Unipiper, who pedaled around us in circles while playing the Game of Thrones theme song on his bagpipes. Yay Portland! On Thursday evening was the Roadshow, where 60 artists had tables selling their wares. Across the board, all the artists were very talented people and I felt honored to be among them. I met a girl who said she reads this blog. (You know who you are, hi!) But despite the turnout and the presence of alcohol at the show, I sold very very little. So that was disappointing. I don't know if my art just wasn't a good fit for this show, or if the attendees were just mostly broke artists. When I got bored, I started keeping track of comments people made to me. Ten people told me that my work "looks traditional," and two people told me that I "look young." 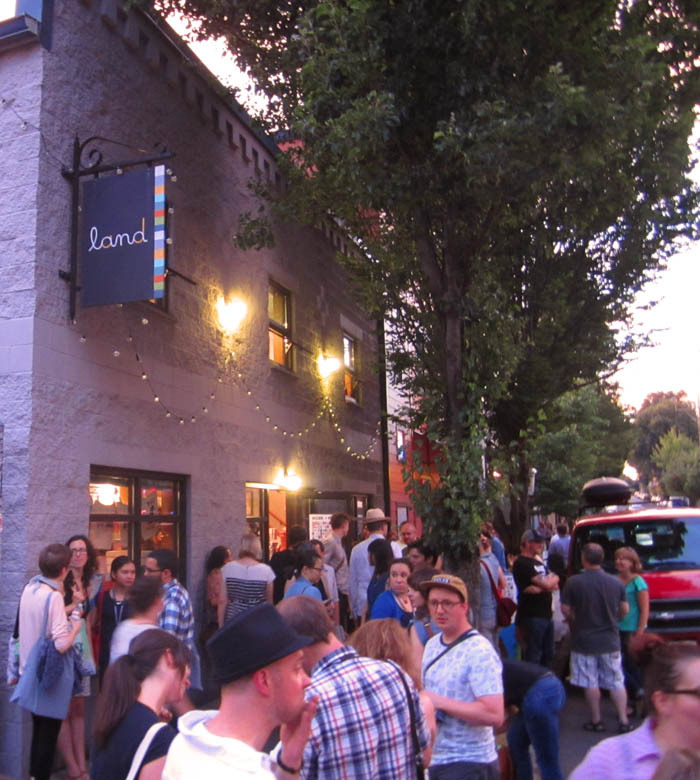 On Friday evening was the "Work and Play" show at Land Gallery. I created my "Busyness and Inspiration" illustration for this show, and it hung on the wall with the other selected pieces. This was the first time my art has been in a gallery! On the final day the keynote speaker was Damian Kulash, lead singer of OK GO - and although his talk wasn't illustration related, he still had some interesting insights into creativity and the balance of work and play. Some of the best speakers were Mac Barnett, Jon Klassen, Robynne Raye, Linda Joy Kattwinkel and Andy J. Miller. But there were quite a few boring speakers. Their talks followed a pattern I named "The Chronological Model." First they would talk about their childhood. "I lived here, then we moved here, then I went to school here, then we moved again." Next they would show photos of projects they were working on. 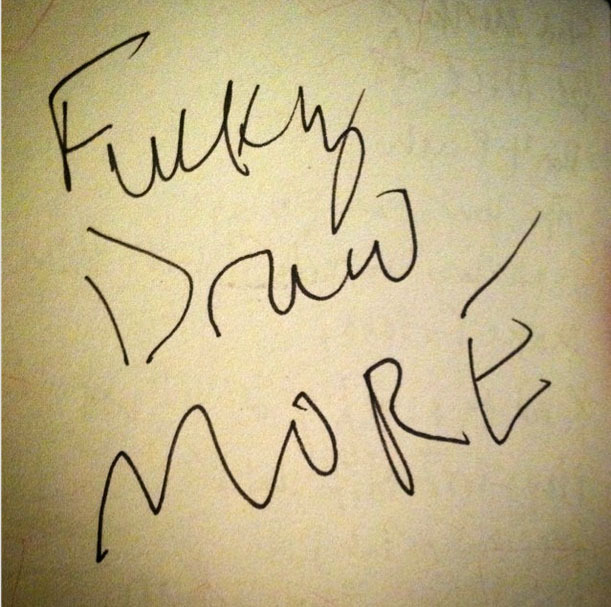 "Here's a thing I'm drawing. Here's another thing. This is a thing I painted. Here's my studio. Here's a statue I made. Here's a drawing of my dad. Here's a show I did." It was like listening to a 2nd grader do show-and-tell. I don't want to be too harsh, since most artists aren't professional public speakers, but it did seem like they were pretty unprepared and even unsure of why they were up there. Overall, I enjoyed ICON for the inspiration, motivation and the chance to meet cool illustrators, who are the nicest people in the world. However, I don't feel like I left with a lot of practical information that I can apply to my own career. The scope of the conference was just too broad. Basically, inspirational, not practical. Your friend Johnny should go into business writing executive summaries. That is one mean (as in intense) bagpiper! Kelley, thank you for this report and always sharing pertinent information with us. Your writing style has a lot of your funny and quirky personality in it. I've enjoyed reading your posts. Thanks Shirong! I really appreciate knowing that someone is reading my craziness. Kelley, I'm sorry you had a disappointing Roadshow experience. A lot of people traveled to attend the show, and I can see how perhaps they didn't want to crush prints or originals in their suitcases, but hopefully you made some good contacts and got to make a few friends there. A lot of people didn't make it into the Land show or the Roadshow, so you were one of the lucky few who got to be a part of both experiences. Also sorry you found so much of the programming dull. The speakers were prepared. This is a conference more about converging, getting together in person when we otherwise lead very solitary lives, and getting to hang out and see what other folks are up to rather than an educational intensive, but there are opportunities for both and hopefully a year from now, something will have resonated with you and made you feel more positive about the experience.